1. Financial assistance is provided to 15 meritorious students (13 for ST and 2 for PTG) for pursuing higher studies abroad at the Masters level and Ph. D and Post-Doctoral research programmes in 35 specified disciplines of Engineering, Technology and Sciences. 2. The Scheme attempts at enhancing the employment avenues for ST candidates. 3. 100% Central Assistance is provided directly to the candidates. The extension of stay beyond prescribed period for levels of courses as mentioned above, may be considered without financial assistance of any kind except the air passage to return to India, on the recommendation of the competent authority in the educational institution/ university as well as the Indian Mission abroad. 1. The candidate should belong to Scheduled Tribe community. 2. The candidate should be First Class with 60% marks or equivalent grade in relevant degree for Master Degree, Ph.D. and Post Doctoral Research. 3. The age of the candidate should below 35 years. 4. Total income from all sources of the employed Candidates or his/her parents/guardian should not exceed Rs. 25000/- per month (excluding such allowances as are not treated as part of the total income for the purpose of income tax). 5. Not more than one child of the same parents/guardian is eligible. 6. Candidates who are in employment must forward their applications through their employer along with their NOC. 7. The finally selected candidates are required to obtain admission and join an accredited university/ institution abroad within three years from the date of communication of selection. 1. 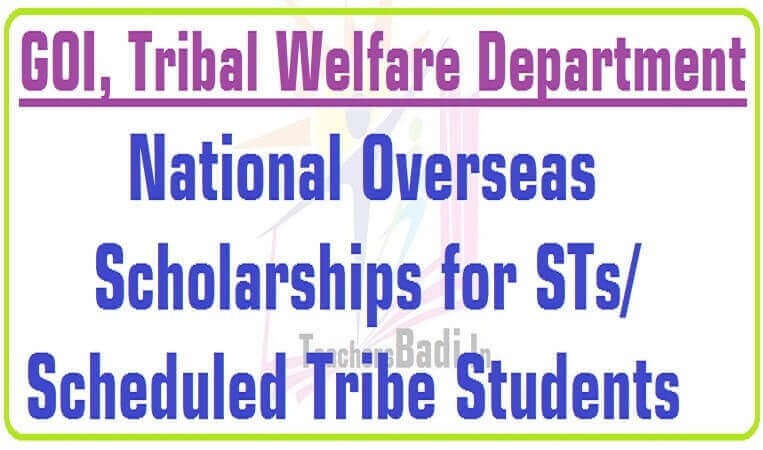 The selected candidates are given cost of tuition and other educational fees charged by the foreign university etc., maintenance and other grants along with travel expenses. 2. Only Passage Grants are available to four ST candidates every year who are in receipt of merit scholarship for Postgraduate studies, Research or Training abroad (excluding attending Seminars, Workshops, Conferences) from a Foreign Government/ Organization or under any other schemes where cost of passage is not provided. 3. The awardees are permitted to supplement their prescribed allowances by undertaking Research/Teaching Assistantship up to prescribed ceilings. Where income earned is beyond the ceiling, the maintenance allowance under the scheme shall be correspondingly reduced by the Indian Missions abroad.